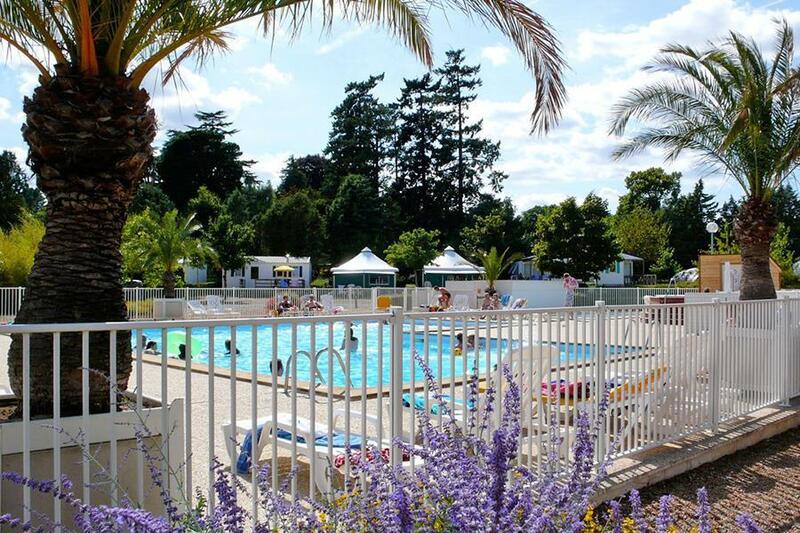 Camping d'Angers-Lac de Maine is a campsite with 143 touring pitches. During low season, between 12-04-2019 - 04-07-2019 and 25-08-2019 - 03-11-2019, the nightly rate is €16,- at one of the 143 touring pitches at Camping d'Angers-Lac de Maine in Angers (Maine-et-Loire). At this campsite you can not only use your CampingCard ACSI for inexpensive camping, you can also use your ACSI Club ID (as an alternative ID). In the heart of the Anjou in an unusual location: close to a famous historical town in the heart of 100 hectare area abundant in water. 1 hour from famous tourist towns, surrounded by renowned vineyards. Area of good living, gastronomy, heritage and a lovely climate. Recreation ground. Offers opportunities for sailing, swimming, walking, fishing. Bus stop 300 metres from the campsite. Large campsite with varying size of pitches, managed to get one with shade near excellent toilet block. no cafe on site out of high season and nothing at adjacent lake. great market in Angers on Saturday but need to get there on team as little parking nearby. Overall a very nice site situated on a large lake within level walking distance of Angers (45 mins). The lakeside location is very popular with locals and you’ll see plenty of walkers, cyclists and joggers all enjoying the setting. However, there was some unwelcome noise at night. It was a warm weekend and there was quite a bit of noise going on well after dark. The biggest annoyance was what sounded like a rave somewhere in the local area that started at 1am and continued until 10am. The bass tone was so loud you could feel it. Assuming you don’t have any noise issues this is a great site and I’d happily return. A lovely site on the outskirts of Angers,which is easily reached by a regular bus from just outside the site. The pitches are a mix of shade and/or grass. Most are long and thin but still roomy and marked by hedges. Sanitary facilities are clean and plenty, with heated showers and toilets. Reception is friendly and efficient, with English speaking staff. It is quiet and picturesque. Other facilities include a swimming pool, games room, restaurant (open July and August), table tennis and a covered volley ball pitch, as well as the usual boules area. We would definitely recommend this site. Stayed here 9 and 10 sept. Pitches long and narrow with water and power. Spotless toilets and showers and good hot water. Lovely easy 45 minute walk to centre ville Angers. Bread available in morning but nothing else available on site at this time. The bus also stops outside the campsites. Lady on the desk was most helpful and spoke english. Very nice site just outside city of Angers with low cost bus into the centre (bus stop near site entrance). All pitches have electricity, water and drainage and are reasonable size. Staff were very helpful and facilities were excellent. Very good bike path adjacent to site. Very good vaule and we would not hesitate to return. Friendly staff, very clean toilets,well kept site. Easy access to cycle routes. Sadly our visit was spoilt as we couldn't cope with the heatwave temperatures. Good access by road but we will return another year to explore the area more. Stayed here a couple of times. Pitches are very big and easy to access lovely lake to walk or run around (6k) and 45 min walk into beautiful Angers. Good shops close by and staff very helpful. Pleasant site at any time of the year. Next to a large park and 20min cycle to centre of city. Lovely pizza place on the water. Toilets and showers are now shared which is a shame. Always clean and tidy. Very good site with very helpful staff. Pitches were rather long than wide, but suited our motorhome. Facilities all fine and a fab pool . Nice cycle route into Anger which needs a couple of days at least to look round. Massive lake to walk/ cycle round next to the site but part of the route was flooded due to heavy rain. The site even had a number plate recognition to operate the barrier. CampingCard ACSI will send your information request to "Camping d'Angers-Lac de Maine".